While I expect performers like The Killer's Brandon Flowers and Muse's Matt Bellamy to engage in stage gymnastics, head banging and so forth, for some reason I get uncomfortable when classical performers move about. Beethoven does not make sense to me when played too theatrically. 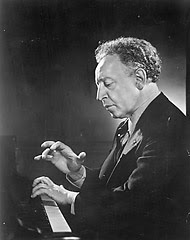 I suppose I expect them to behave like a classic Arthur Rubinstein when playing a splendid sonata or concerto: it is all about the music and the piano and not about the performer's spiked hair, adorable smile, or the arching of the back. 'I had to turn away. I could listen, but I couldn’t watch. Two performers, four glazed eyes and four waving arms were too much for my stomach. And if someone with a lifelong love for the piano repertory has this kind of reaction, what about those coming to classical music from the outside? Think of the smart young people ready to believe, filled with curiosity and good thoughts, and imagine with what astonishment and amusement they must come away from such scenes. It’s another reason classical music is not reaching more young people: not because of how it sounds, but because of how it looks. Even worse, lugubrious gymnastics like these advertise the feelings of performers, not of Beethoven or Schumann. Music is asked to stand in line and wait its turn. Our two pianists might simply have been talking themselves into playing well and sharing the conversation with us. Maybe they didn’t trust their own ability to make music without a little theater to juice up the proceedings. Elaborate arm waving and heaven-bound gazes, at any rate, seem to have become part of the conservatory curriculum, like accurate scales and counterpoint. Some, I am sure, watch the wrong people and engage in monkey see, monkey do. More often, I suspect, performers just want everyone to know how wonderful they are, right down to their virtuoso fingertips. There are bad examples out there. Liszt evidently jumped around when he was a young touring virtuoso, but he is said to have sat at the piano like a stone later in life. Glenn Gould, who acted out his musical eccentricities with remarkable finesse, looked like the music he was making. And the winning sentence had to be: "Serious theater in the wrong hands turns unintentionally into physical comedy." Didn't Franz Liszt start this moving about business? Too much calisthenics..., never got the point of that either. another example of contextual relevance. i'm not sure everything need a modernity-colored interpretation. this is not the circus. and lizst stopped the theatrics eventually, yes? Tja. I never got the whole idea behind calisthenics.